A prominent alumna who spent nearly two years here as a visiting scholar from the U.S. Department of Energy is now vice president of an environmental remediation and consulting firm based in Oak Ridge, Tennessee. Sue Cange, BE ’82, MS ’83, is vice president of environmental and regulatory services at Navarro Research and Engineering. She will manage Navarro’s strategic environmental and regulatory opportunities, as well provide executive contract support and oversight. 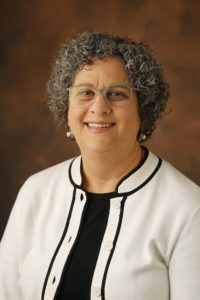 It is a new position at Navarro, which manages large and complex turn-key environmental remediation, decontamination, decommissioning, and waste management projects, as well as providing nuclear operations, nuclear safety, facilities management and other technical services to federal agencies across the U.S.
Cange, with three decades of experience in federal leadership positions, started in July 2017 as a visiting scholar in the Department of Civil and Environmental Engineering. She worked on a number of initiatives focused on workforce development, including an internship program that will place students with the U.S. Department of Energy. She began her new job earlier this semester and has returned to campus each week to teach her Monday evening class. Most recently, Cange, who helped develop the EPA policies that govern cleanup of contaminated Superfund site, was Principal Deputy Assistant Secretary and Acting Assistant Secretary for DOE’s Office of Environmental Management. She also was the DOE manager for cleanup at Oak Ridge.